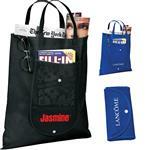 the Latitudes Custom Folding Tote and Promotional Foldaway Shopper. Pack it in with this fun, unique tote that's perfect for the grocery store or farmers market. 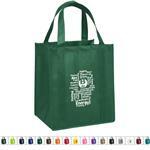 Tote folds into a carrying pouch with drawstring. 18" shoulder straps and PVC free. When folded, pouch dimensions approx: 5"H x 3.5" dia. 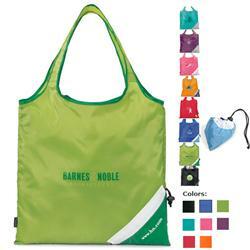 This fun promotional bag is kid-friendly/CPSIA compliant. A FREE RUSH PROMOTIONAL BAG - 1-DAY RUSH PRODUCTION AVAILABLE! Available Colors: Black, Royal Blue, Apple Green, Tangerine Orange, Pink, Plum/Silver, Turquoise/Silver, White/Black, and White/Red. Setup Charges: $55 per color for transfer or screen. Inquire for full color imprint. Available Imprint Options: Screen or Heat Transfer. Please inquire for pricing on multi-color imprint.